Last weekend, as you know, the ITF office staff packed up and attended a wedding in Delaware. We put, oh I don’t know, 1400 miles on the ol’ Monte Carlo from Friday to Sunday. That’s a lot. Fortunately, my old buddy Russ came with us and I of course conned him into doing a bunch of the driving. 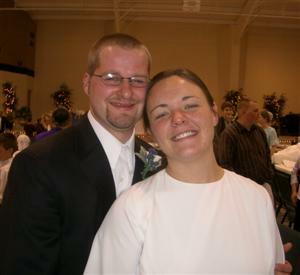 It was good to be at Justin and LaDonna’s wedding, it was very nice. Lots of music. My wife and I helped serve at the reception. AHQ warbled a tune as a trio. I got to see a lot of people I rarely see, that was fun. Got to talk to my buddy Rob a bunch! He’s a true friend to ITF, I probably should pay him for all the PR work he does for me. This one dude I didn’t know from Adam introduced himself to me and admitted he was a follower of ITF. I asked where he heard of me. He had to point a finger at Rob! What a guy. I made Rob and his boys sing a couple of tunes for me, they’re really good! Them boys are being brought up right. Aunt Gladys told me she likes the dental escapades I broadcast on this forum. I do have a few regrets, there were some people I wanted to corner but it never happened. Like Ryan and some other former and current Utopians. So anyway, we left DE in the early evening and heading for our friend Deb‘s house in Lancaster Co. PA. I think a tremendous amount of her parents, Alvin and Ruth. They barbecued chicken for some sandwiches for me at 10 or 11 that night! I’ll never forget that, will I. Nope. We had a wonderful visit there, but then we had to leave early Sunday morning for SMBI. So we did. Voice of Praise was singing there in the morning and we arrived just in time. It was a great program and it was good to see them again. They had to leave soon afterwards, but we had a good time visiting while we could. Another reason for stopping at SMBI was to visit certain students. That’s my nieces Jenna, Annie (she was visiting her sisters), and Brianna, then it’s my wife and David The Baritone. 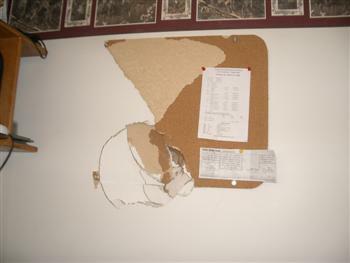 Then I went and visited the infamous dorm room with the bashed in wall. It’s all true, it really happened. I saw it with my own eyes. It’s big too! Looks more like he bashed it in with his head instead of his hand! In the world of menial labor performed by the common man, management and other related personnel are not alway looked on with great appreciation and admiration. Us salt-of-the-earth do-the-real-work types have seen too much production hindered, stupid mistakes made, and totally nonsensical decisions passed down from management to be enamored with the ridiculous notion that our higher-ups are going to protect and look out for us. And the engineers. Oh my, sometimes it seems like their job is to just make our job difficult and mess up the units. And we wonder, what do all these engineers DO all day, week after week? Yes, they design new travel trailers and whatnot, but that can’t take forever! We don’t churn out that many new models. One day we had complete production disaster. It was bad, it cost a bunch of production and lost time and who knows what all. Turned out the engineers changed the floor design then forget to give the mill room new cut sheets, so all the wood for floor build was cut wrong. The very next morning we had a plant meeting. The plant manager finished up, then asked if any of the foremen had anything to add. One said yes, there’s been a problem with some people parking in the premium parkings spots designated for the engineers. Ha ha! What poor timing! The snickers going around indicated a less-than-positive vibe towards the engineering department. They do a ton of loitering and walking around on the factory floor holding papers and appearing important. Maybe they actually are doing something important, but either way they make easy targets. I previously mentioned that Voice of Praise released their new CD, Deliverance. And thanks to Glen’s (Random Pitches) thoughtful care, I now proudly possess my own copy. I’m going to seize this opportunity to contribute some comments about this project. I’ll start with the bottom line: This is a fantastic recording. Their best ever, I really like it. They’ve made some real improvements as a group, and this disc is the evidence. The first thing I noticed was a very different overall sound than their last CD. It had gallons of reverb whereas “Deliverance” has a much tighter, closer, less “noticeable” reverb. It makes for a very honest, intimate sound. The second thing I thought was that they’re taking some steps into new musical territory! They tried some new things, and I think it was a slam-dunk success. There’s a couple of arrangements on this album that, correct me if I’m wrong, stylistically they’ve never really experimented with before. VOP has largely stayed close to traditional, classical, and often “choral-type” arrangements, that’s where they’ve carved their niche. But the new ground covered here is a wonderful, complementary addition to their formidable musical arsenal. It’s fresh and new but doesn’t take anything away from their normal repertoire. VOP opens the disc with a Tim Rumsey arrangement of “Come Thou Fount of Every Blessing.” They have used a lot of Rumsey arrangements in the past (there are two on Deliverance), in fact have commissioned them. He writes layered, textured, full, 4-plus part material, very nice stuff. And it suits Voice of Praise very well. Love that final fat chord! VOP has traditionally used a lot of stacks (recording over top of themselves to double the voice or add extra parts) on their recordings, and this one is no exception. They use this recording technique to great effect, such as on the Rumsey pieces. I have to mention track 3, “Didn’t My Lord Deliver Daniel.” This is a cut off the King’s Herald’s classic “It’s Spiritual” album from 1974. If AHQ would still be singing, I’d have been pushing to do this song! I love it, and I’ll sing it someday. I must admit, I’ve never liked the song “The Old Rugged Cross,” but their treatment of it here is very nice. It’s a Walt Harrah (of the Haven Quartet) arrangement, and I like his work. This tune stretches VOP in a new direction a little bit too, and it’s a great addition to the disc. Track 7, “Down by the Riverside,” two words: Kirby Shaw. Voice of Praise does vocal jazz! Who’d have thought! They tear it up. It starts with the bass laying the rhythmic foundation, then the tenor lead (go Josh!) joins him and they sing the first go-round by themselves. Then everybody jumps in and it takes off from there. Check out some of the background patter: “Ooo, now we-e don’t need it!” Great stuff! “Hallelujah, What a Savior” is an in-house arrangement by Jon Zehr. He uses the music to bring out and emphasize the journey dictated by the lyrics. I doubt you’ve ever heard the song quite like this. “I’m Gonna Let it Shine” is a children’s medley also arranged by Tim Rumsey. It has a lot of variety, and I think the kids will probably like it as much as I do! Very cool. I must mention the cover photo. For a conservative group, they took some risks here too! And once again, I think it paid off handsomely. It’s a fresh, unique, interesting, and compelling cover. Who knows, I may be commenting on Voice of Praise more later. Because guess what? I’m going to hear them in person this coming Sunday morning! Terrific CD, I highly recommend it. Order it at VoiceofPraise.net. Part 3 of 3 parts. Click here for Part 2. The Heralds did a handful of great a cappella albums in the last 15-20 years too. The “I Need Thee Every Hour,” “The Way We Were,” “Christmas,” and “Git on Board!” albums had a lot of a cappella. Their a cappella stuff is tight, smooth, and often sophisticated. And it’s in tune. Jim Ayers is a wonderful bass, huge range and great ability. And unlike so many SG basses of today, he can actually sing in tune! His skill aren’t limited to just hammering out subterranean low notes, he can really “sing” all through his range. Herein lies the rub. I just can’t imagine Jeff Pearles stepping in to Jim Ayers’ shoes and singing for the Heralds. I don’t think he has what it takes. Don’t get me wrong, I’ve always been a big Jeff Pearles fan, I like the guy. But he’s a southern gospel bass. I’m just trying to figure out how that’s going to work in a group like the Heralds. PSQ did an album a few years ago called “When He Blessed My Soul,” it consisted of a bunch of old SG quartet songs. That’s right down my alley, so I bought it. Pretty good album, but man, out of tune like I couldn’t believe! And Jeff was one of the worst offenders. I’m left thinking, how does a major SG group put out a studio project (“budget” recording or not, I don’t care) this badly lacking in a such a basic musical concept as intonation?!! It frightens me. So, I don’t want to be a big pessimist over this whole personnel change, but I am a bit worried. I’m hoping for the best though. I’ll cut them some slack. Part 2 of 3 parts. Click here for Part 1. “Best kept secret” is a phrase that’s overused a lot, usually without merit (it was even used on AHQ once! ), but in the case of the King’s Heralds it’s true. The southern gospel world has never heard of them. 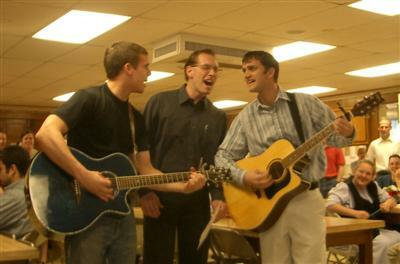 They travel extensively across the US, but do mostly church concerts and many of those are very small. They’ve also done a lot of international travel. The quartet has been in existance for over 70 years with astoundingly little turnover. Their music is more “musical” than your average SG stuff, not so much run-and-gun and whoop-and-holler, a little more finesse and sophistication. Less emphasis on over-emotion (at the expense of musicality) and more focus on musical integrity. 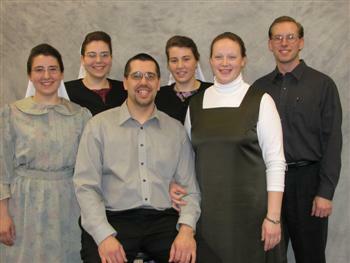 They have a pretty big following in Mennonite/conservative circles, probably largely due to their high-quality traditional quartet style of music. And they’ve done a ton of a cappella stuff, that’s why I’m a rabid follower. One of my favorite lead singers, Jerry Patton, sang with them for over 35 years. My favorite configuration was Jerry on lead, Jack Veazey on baritone, Don Scroggs on tenor, and Jim Ayers on bass. All unbelievably nice and friendly people. This specific group was together for a long time, near or around 15 years if I remember correctly. Jack retired (after some odd 30 years! ), then a few years ago Jerry did too. This whole Jeff business was the first that I heard Jim Ayers was gone. They did some fantastic a cappella stuff over the years. The inimitable, unforgettable “It’s Spiritual” album in 1974 (Jerry and Jack were on that album) was all a cappella, all spirituals, and all Wayne Hooper arrangements. Wayne sang baritone for the Heralds in the ’50s, I believe, but continued to arrange for the group ever since then. AHQ’s “Soul’s Been Anchored,” “Keep in the Middle of the Road,” (both in Purpose) “Climbin’ up the Mountain,” and “Swing Down Chariot” of course came from this album. “The Lord is Coming, Are You Ready” (on Lookin’ Up) is also a Wayne Hooper composition. So the first unsolicited email I get from the new Contact Form is my accountant reminding me there were only three and a half weeks until April 15! Oh man! I’m going to take that dumb thing down! I told him awhile ago that I was going to try getting all my stuff to him early this year, so I guess I deserve it. Awhile ago I started writing an editorial about the latest new member of the King’s Heralds. I never got around to posting it until now, so it’s slightly out of date, but not too much. It’s kinda long, so I think I’ll post it in parts. To a certain extent, I keep a fairly close watch on the Southern Gospel scene. I love a good southern gospel quartet, though I quickly tire of over-instrumentalization and unimaginative, lackluster arrangements. Oh yeah, and mixes where the first tenor is so hot that the baritone (or often the lead) is nonexistent. Good SG quartets are becoming hard to find anymore due to these rampant problems and others like them. Anyway, so I read that in a recent round of musical chairs Jeff Pearles was leaving the group he was currently in and joining some unknown group called the Heralds. Hmm, I thought, I wonder who they are. Jeff became well-known as an up-and-coming young bass when he joined the Palmetto State Quartet a few years ago. One of those little guys with a big voice, he was pretty popular. A little trivia on the side, you know that announcer intro/voice over to the Cathedrals‘ “Radio Days” recording? 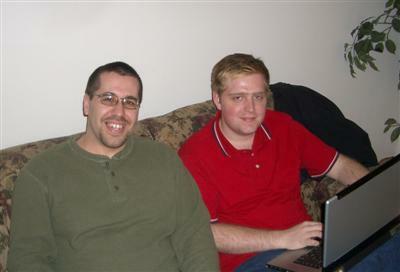 That was Jeff, before he was with PSQ. Back to my editorial: Yawn, more so-and-so leaves this group and joins that one. Then I’m directed to this article. Oh my goodness. Jeff is joining the King’s Heralds. What ! How is this going to work ! I’ve been piddling with the site a little bit, you’ll notice that all the posts have now been categorized. And check underneath that astonishing portrait of the Editor over on the right, and you’ll notice a Contact ITF link. Yes, now you can submit your feedback and praise through the brand new email contact form. I’m bracing myself for the floodgates of communication to burst open upon me. Future improvements: hack the theme so the sidebar shows up on single post pages, create a “Best of ITF” category, and someday I need to come up with a header image. And I’m sure there’s more. Edit:Actually, I’m not sure the contact form works yet. Stupid thing. I’ll let you know when it is working. Edit 2:Ok, I guess it does work. Fire away. My wife was going through some old school papers tonight and she was reading some of them to me. She’s posted a few things at my expense, so I thought a little payback was in order!